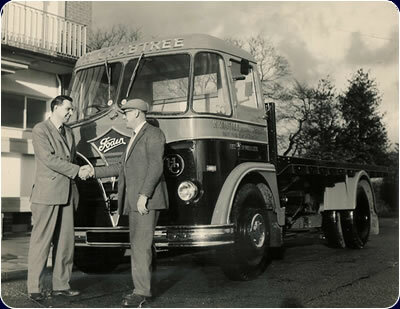 During the 1930s, Harry Crabtree purchased a single lorry. He established a greengrocery delivery service, but a heart attack at the wheel of the vehicle in 1936, put a stop to the development of the Company. Harry Crabtree's son, Roy, inherited the vehicle in 1946 at the age of 24, after training to be an accountant, then serving in the RAF in the Second World War. Between 1946 and the early 1960s, Roy developed the business ‘H. Crabtree’, steadily increasing both the number of vehicles and employees. On the 31st August 1961, H. Crabtree Ltd. was formed based in New Mills, Derbyshire. During the 1960s and 1970s the Company expanded by approximately one vehicle a year. By 1968 the Company owned twenty vehicles, two of which were working for Derbyshire County Council (DCC), whilst five flat vehicles were used for general haulage, carrying paper, firelighters, precious metals and building products. Thirteen vehicles were ‘tippers’ carrying quarry products and coal. In 1977 the Company bought its first articulated HGV to work for Union Carbide in Glossop. Unfortunately the factory closed down in the mid 1980s. 1985 saw tipping work decline due to the miner’s strike. This year also saw the purchase of the Company’s first Tautliner vehicle and then in 1988 all Derbyshire County Council work terminated, as the Council wanted to lease vehicles and employ their own workforce. By 1990 the Company owned thirty-five vehicles and ten trailers (used on general haulage carrying chemicals, plastic compound, fabric and precious metals). These were a mixture of rigid and articulated vehicles and included three tippers – which were kept until the mid 1990s. During the 1990s the Company’s work changed to include contract work and in 1998 a contract with the PVC Group resulted in the first bulk tanker being added to the fleet, carrying on the tradition the firm had started in bulk transport. All the other vehicles now had Tautliner bodies. In 1993, a contract with a large Belgian company Deceuninck (who manufacture PVC-U window systems) was established; this led to the purchase of six new vehicles painted in Deceuninck’s livery, operating from their factory in Calne in Wiltshire. On the 1st April 2004, MJ Transport Ltd. a family run haulage Company with ten vehicles and their own premises was purchased and all of their staff and assets were incorporated into H. Crabtree (Calne) Ltd. The parent Company, H. Crabtree Ltd. and the subsidiary Company, H. Crabtree (Calne) Ltd. together now employ more than 80 people and own a total of 50+ HGVs.